The Horizon Energy Box provides more than 100 possible experiments—including fuel cell and hydrogen experiments, wind and solar experiments, and thermal and electric mobility science experiments. This gives students a complete understanding of fuel cell technologies for renewable energy applications. It includes a CD-ROM with curriculum content for 40 hours of classroom activities. The fuel cell science experiments, which were designed by fuel cell experts, include the PEM hydrogen fuel cell, direct ethanol fuel cell, salt-water fuel cell, and reversible fuel cell—all in one kit. 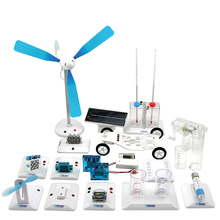 The Energy Box introduces renewable energy with a solar panel, a wind turbine, a temperature cell, and a hand crank generator. A super capacitor is also included, illustrating the latest in energy storage technology. 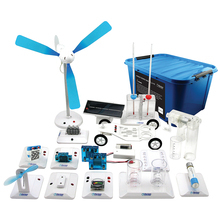 The kits can be used to address Next Generation Science Standards*: MS-PS3-2, HS-PS3-3, HS-PS3-4. How many blades are best—1, 2, 3, or more?